The fabulous Jenn at The Art of Better has awarded Purfylle with the Liebster Award! A bit of research on the Liebster Award revealed that the origin of the award is no longer general knowledge and that the rules have varied quite a bit since it's inception some years ago. 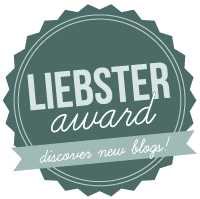 The essence of the Liebster Award is to promote new bloggers. The definition of a new blogger seems to be have many interpretations however the blog must be reasonably young (less then 12 months-ish) and count it's followers at somewhere between 3 and 3000 (I'm sure that it still counts if there's only 2 followers though) I believe this is at the discretion of the blogger passing on the Liebster Award. Those who receive the award answer questions (in a blog post) posed by the person who passed the award onto them and they in turn pass the award onto several more bloggers. I believe the award will be more readily passed on if the guidelines were updated to reflect the time constraints the modern blogger faces. Therefore I am pleased to implement a change to how many blogs the award must be passed onto by those who have received the award to (approximately) a third of that previously (9-11) making it 4 blogs. Ideally the owners of the blog will have already agreed to accepting the award prior to publication. So onto answering those crazy questions! Partly to share my sewing projects with people who are actually interested in them instead of driving my family insane with them. Partly as a way to keep track of all my research instead of scribbling it on bits of paper and notebooks and computer files here and there and partly because I knew if I were truly serious about selling my creations I couldn't hide under a rock. 2. What is your absolute favourite thing to blog about? Historical costumes, my interpretation and construction approaches, the myriad of things that go into the creative process from research, to pattern making, tweaking, mock-ups, materials, stitching, fittings, accessories, trims and on and on and on. But not the documentation. I'm a strong believer in every individual has their own interpretation and you must do your own research to your own satisfaction. 3. What three things can you not be without? Time travel. That counts right? Then I could go and see all the clothes in person, no more wondering how it was done or what was used. 5. If you could have a large block of free time, what would you be doing? Creating a costume wardrobe from top to toe, the patterns, the trims, the accessories for every time period that I love and adore. Hmm, it seems a big wad of cash needs to accompany that free time. 6. What are your main goals for your blog? To keep a record of my projects and what works and what doesn't. To help keep me focused and on track, to remember that I am getting things done even if it doesn't feel like I'm making progress. And hopefully, to help out one or two other people along the way. But that's not very tangible and tangible goals are important. Right now I'm just trying to get my posts written and published and get the pages and layout improved. It will always be a work in progress. 7. Since it’s the holiday season, what’s your favourite holiday movie? Die Hard 1 & 2, because they are so not earnest. They are full of laughs and entertainment. My other favourites are technically tv shows and include Black in the names...any guesses? 8. Link to your most favourite blog post and tell why it’s your favourite. A Moment of Honesty, not because the post itself is a brilliant piece of writing but because of what it represents for me and the blog. That post signifies when everything changed for the blog. I started to allow myself to publicly be imperfect and accept that sorting my home life out has to come before costuming. It's written totally from the heart. Although I started the blog in February I think of that post as the real start. 9. What makes you unique? Inside or outside. My birthmark and that's all the details I'm giving. 10. Name something on your bucket list and explain why. To study historical extant garments in person. Why? Because there is so much to learn by seeing them in person, stitching, construction, fabrics, closures so many many things. I am passing the award on to these great blogs! 7. What inspires you most, movies, people, books, something else? 8. Link to your most favourite blog post and describe why it’s your favourite. 9. What can you be found doing when your being 'lazy'. I'd love for you to link your Award post in the comments so my readers and I can come and read them! You're Welcome. Have fun with those questions!